This is a book I’ve been waiting for. I first saw an example of Sara Impey’s work at the V&A exhibition ‘Quilts 1700-2010 – Hidden Histories, Untold Stories’, and like many other visitors I lingered over it reading the text, and being impressed by the perfect execution of the quilt. I subsequently saw one of her pieces that I liked even better – ‘L’inconnue’ at the Quilt Art at 25 exhibition at York’s Quilt Museum – this was also beautifully made, and I found it witty and thoughtful. In both exhibitions, Sara Impey’s work was amongst the most striking exhibits for me; I really admire her rigour and formality. So, to the book and what I thought about it. It’s in Batsford’s relatively new hardback style, with a very pleasing cloth cover. 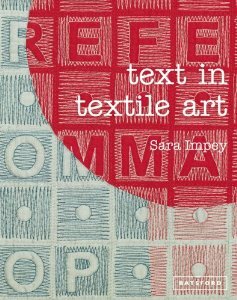 I enjoyed reading the text very much; there’s plenty of it (which isn’t always the case with books about textile art) and it’s very well written and put together. Each time I dip into the book I seem to find something new. There are some examples of text art that I hadn’t seen before (e.g. Lorina Bulwer’s angry sampler from 1901 which is a real find – if you get the book have a look on page 17). I also found some more familiar pieces, like Caren Garfen’s excellent and unusual ‘Main Course, Wafer Thin, a Study of the Role of Fat’ which I saw at last year’s Knitting and Stitching Show. In summary, then, there’s lots to recommend about this book. Any criticisms? Well, much as I like Sara Impey’s work, the illustration of it doesn’t come across very well in book format. I think this is a problem for many books about quilting where the objects themselves tend to be so large, but it applies particularly in the case of her work because you want to scrutinise the text so closely. Also, there are areas I wish she’d had the space to explore in more detail. For example, she mentions in passing the embroidered banners used by trade unions and I’d really like to know more about them. However, I guess that would be a big enough subject on its own for another book. Has anyone else read this book? Do you agree with me? Any comments?